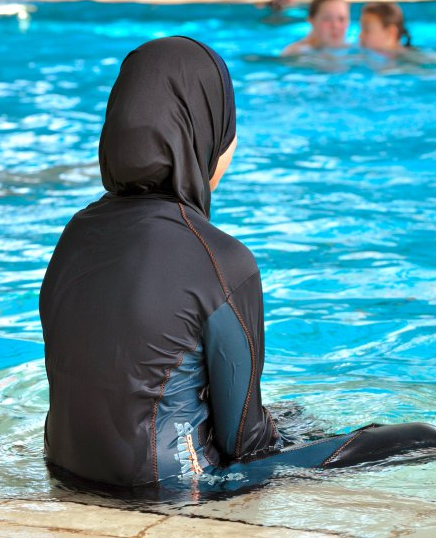 A SWIMMING pool in Austria has BANNED Muslim women from wearing the ‘burkini’ over hygiene concerns. The Austrian town of Hainfeld has put a stop to the total-body swimsuit – complete with head covering – triggered by the country’s far-right Freedom Party. Mr Terzer also called for tighter security amid reports of a rise in sexual assaults at swimming baths in Austria. Most recently, authorities in the Austrian town of Mistelbach issued a temporary ban on refugees after a 13-year-old was allegedly sexually assaulted by a young man, supposedly an asylum seeker from a nearby shelter. The officials posted a sign saying “today no entry for refugees” in the wake of the incident. excuses: gaskamers=douchecabines natuurlijk. Freud en zo.